Reid Rooney is an engineer and a betting expert from the USA. He wanted to create an online betting platform on five different global sports to attract betting experts from around the world. 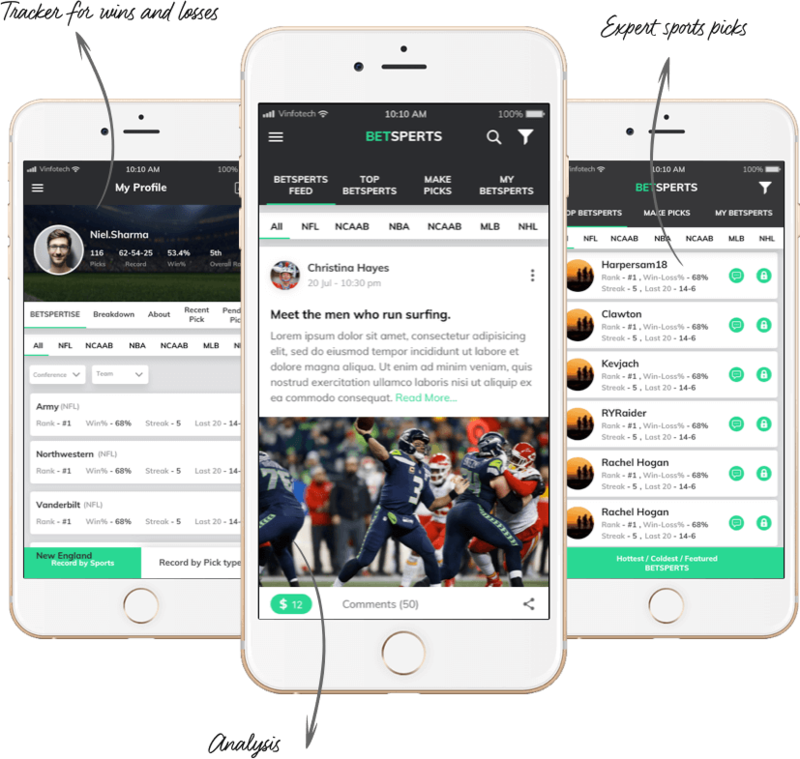 Vinfotech has been creating fantasy sports applications for almost eight years and had first hand experience of betting applications as well. Reid chose Vinfotech due to a variety of experience the team had along with a clear channel of communication. How’s it possible to engage betting experts in five kinds of sports? Our team showed him fantasy sports platforms (that we had created) that had done well with multiple leagues and sports. And even though Betspert was a betting website, the format will be engaging enough to attract fans. It’s a challenge to integrate betting data with sports feeds. We can use sports feeds to source data and one for analysis. We can sync both achieve the desired results. I want a team that understands sports not just betting. We have a team that loves and plays sports. Our sports enthusiasts have developed some of world’s leading fantasy sports platforms. How will the platform attract users? We will include features that are relevant to the demographic along with ways like referrals etc to encourage users for inviting their friends. 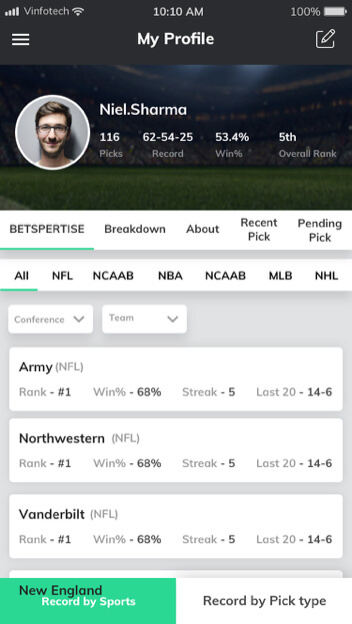 Betsperts provides not only indications of which way the general public is leaning but also breaks down the top experts and how they are choosing each game. Users may follow their recommendations based on their expertise or see how the worst experts are leaning & fade their picks! 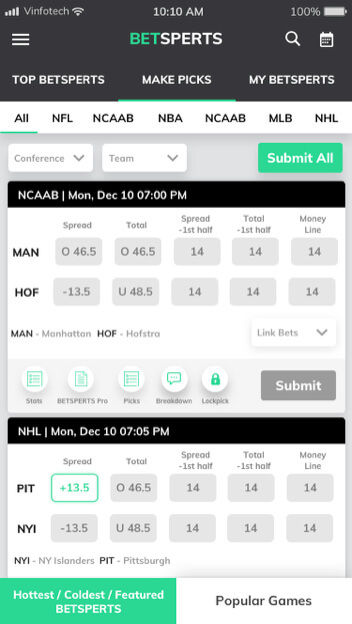 Users can search for experts in each game & follow the best BETSPERTISE to improve their picks! Users can search an unlimited number of Betsperts profiles to follow & analyze their picks. They can find more experts to follow or fade based on their record to improve their chance to win with their own pick. I want to use my knowledge of various sports in predicting and betting legally. 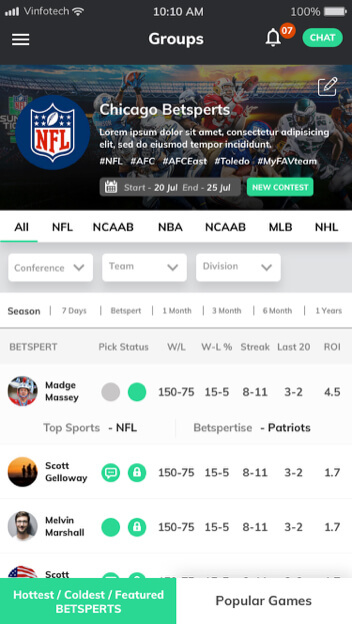 I want to share my knowledge sports with users who are interested in prediction and betting. I am interested in a dependable and legal sports betting platform where I can use my knowledge of sports. Team Vinfotech aimed at a fun and easy to use and sports betting website development that would engage betting experts around the world. While keeping a focus on American user demographic, we created profiles that spanned across the world. 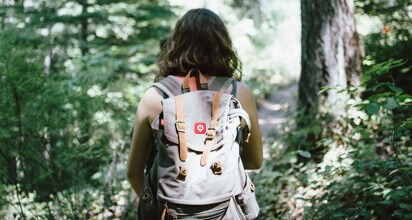 We compared these with our older user demographic surveys to validate our findings. An assessment document was created for future reference and for helping us on track during the project cycle. We held video calls with Rooney so we could keep him constantly in the loop about our plans and intentions with design and development. Betspert was to be an online sports betting community for betting experts. We had to keep the design professional yet fun. After presenting a few wireframes, Rooney felt confident that development could begin. 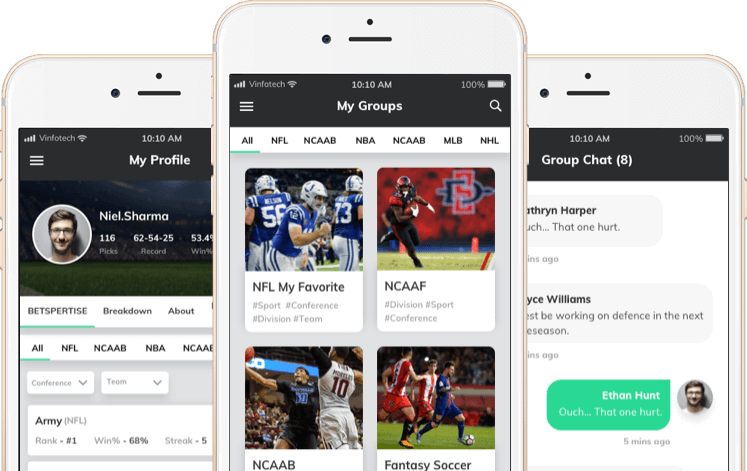 By now, our sports app development team had started to expedite work towards the design part of the application. We soon engaged into active front-end development working through how the designs would interact with users. The major challenge was to integrate betting data with different sports feeds. We used two prominent sports feeds - one was to fetch odds data and the other one was for analysis. We synched both APIs to achieve desired results. Our developers used their experience of fantasy sports development along with their current learning while engaging in development. Our project manager acted as a channel of constant communication between the team and Rooney. We conducted beta testing soon and launched the website within the stipulated time.